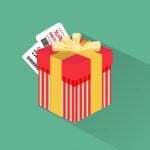 Spammers and fraudsters can become a real headache for ecommerce store owners and effect on how a storefront looks for customers, for example, because of leaving fake comments with links to other resources. To keep your security protection updated and protect your business from spam and fraud, you need a reliable security tool. One of such solutions is Amasty Google Invisible reCaptcha for Magento 2 and 1, and today we will describe its functionality and configuration. Adding invisible Captcha to your ecommerce site will protect you from the sneakiest bots trying to spam your website forms, add fake reviews, or create fake accounts. Let’s see in more detail which benefits the Magento 2 module brings to its users. One of the advantages of the extension is that it adds reCaptcha protection to any type of forms you use on your website. Adding spam protection to a custom form requires configuring just a few settings. 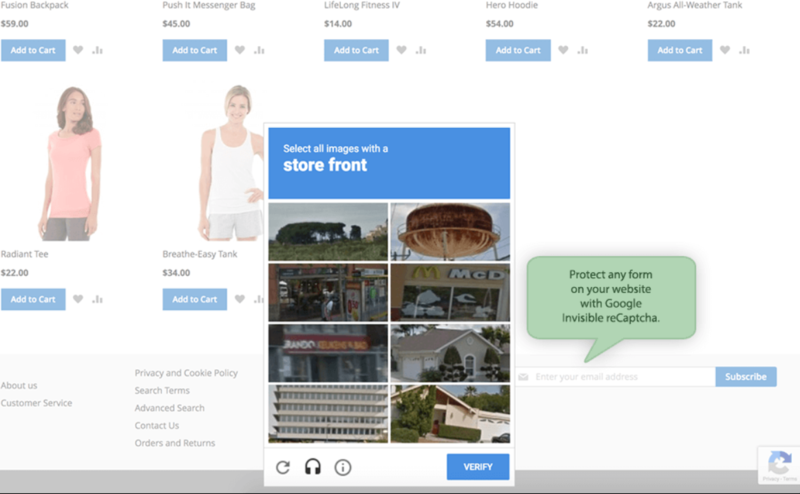 You can protect your web store with invisible reCaptcha security using built-in configuration for three forms out of the box. reCaptcha can be added to both login and registration forms, comments and reviews form, and subscription form. For safe sessions, Invisible reCaptcha won’t disturb your website visitors requesting them to solve security quizzes. However, if a suspicious request is detected, the reCaptcha test will appear. Users don’t need to have special coding skills to configure the reCaptcha protection since the extension provides them with a ready-made template requiring just a few links and a piece of code to be inserted. 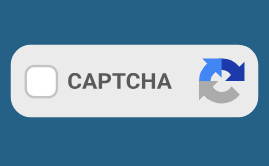 With various options and user-friendly backend offered by the module, Google reCaptcha can be set according to specific needs. The extension configuration allows defining the language for your Captcha that will be used instead of customers’ browser preferences. Moreover, it is possible to select the position and color scheme for the reCaptcha badge fitting your store theme. Support of Amasty Custom Form and FAQ & Product Questions for Magento 2 enables you to add captcha protection to these modules’ forms with a few clicks. To configure Google Invisible reCaptcha settings, navigate to Stores -> Settings -> Configuration -> Amasty Extensions -> Google Invisible Captcha. The extension configuration is divided into three sections: General Settings, Invisible Captcha for Amasty Extensions, and Advanced Settings. 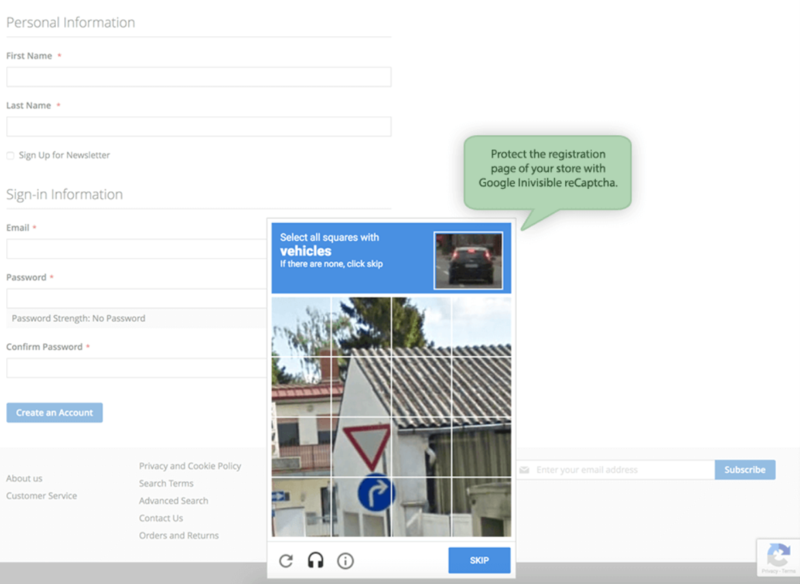 In General Settings, you enable/disable the extension, enter your site key and secret key (you will get the keys after registering your website domain on the Google reCAPTCHA page), and set the language for reCaptcha. 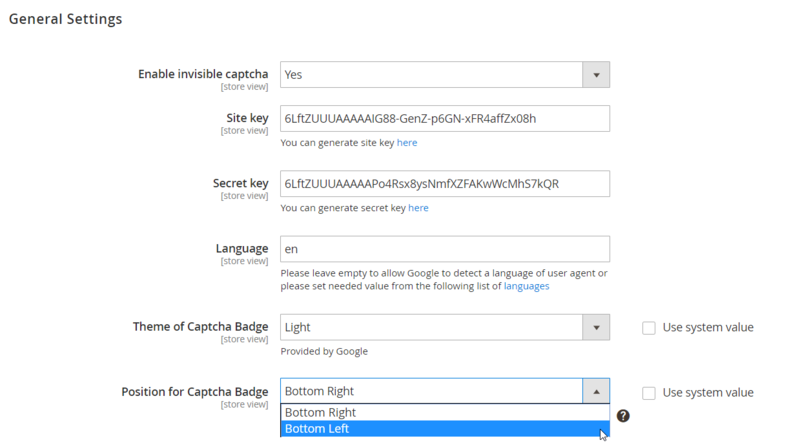 Next, select the theme and position for the Captcha badge. The next section allows enabling or disabling Invisible reCaptcha for the supported Amasty extensions if they are installed on your website – FAQ & Product Questions and Custom Form. As for Advanced Settings, here you can specify the settings to add Google reCaptcha to any form type on your web store. In the ‘Urls to enable’ field, insert the URLs where a specific form will be sent. Then, specify the CSS selectors of a form. New feature: possibility to choose a theme and position for reCaptcha badge. Support for Amasty FAQ and Product Questions was added. In-built support for Amasty Custom Forms was introduced. Now it is possible to set the language for Invisible reCapctha. Default Captcha configuration for newsletter subscription, product reviews, and registration forms was implemented. Now the module is compatible with the Hide Price extension. 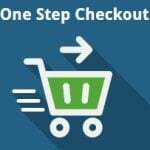 Amasty Google Invisible reCaptcha for Magento 2 and 1 offers its users optimized procedure for reCaptcha security integration into an ecommerce site. The module provides flexible configuration and pre-configured settings for most popular forms. Google Invisible reCaptcha is a powerful tool that will solve the issues of protecting your online store from suspicious visitors and bots. While your website stays secured, the user experience is not spoiled by disturbing security quizzes when they are not necessary.